Turkey season has started or is about to start in many states across the country. The Nebraska season began last Thursday and I was fortunate enough to get to go hunting. Early season is always a special time to hunt because the turkeys are still in their large winter groups. Later in the season when mating occurs more frequently it can be difficult to call toms away from their hens. But early in the spring those big gobblers are more apt to investigate a call because receptive hens are not as abundant. So we set out with quite a bit of confidence for the opening day of the season. On this particular property the turkeys began roosting in the power line towers this year, which they had never done so before. With over 100 birds roosted in one of those towers, we snuck as close as we could without being seen and set up our blind and our chintzy little decoy. This early in the year I am not too concerned with the looks of my decoy. In my observation, later in the season when the birds have been hunted they seem to be a little more picky about the decoys. The gobbling that morning started off intense. Not only did we have that flock of over 100 birds sounding off, but we had groups of toms from all directions coming towards all the commotion. There were, at times, no less than 50 toms all gobbling at once. We figured it wouldn't take long before a group or two decided to come check out our calling, which paled in comparison to the noise that the real turkeys were making. After about an hour we had a group of four toms come by. 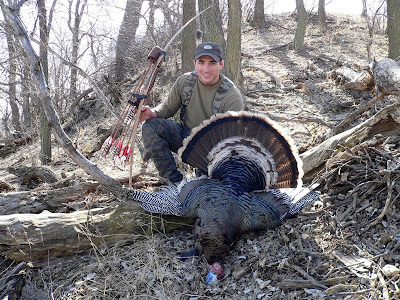 I killed this turkey with my Mohawk longbow, a CX Heritage 150 arrow, and a Simmons Shark broadhead. If we could have recovered the turkey we probably would have had many more shot opportunities that morning. Groups of toms continued to come to our calling but got nervous seeing the dead turkey and never came close enough for any shots. Below are some more pictures of the hunt. The power line tower in the background is just like what the turkeys were roosting in. The big tom on the right is the bird that I killed. One of the many groups that came no closer because of the dead turkey.